I agree with you about the El Sitio sandwich. Even the photo looks unappealing. I also agree that Miami is probably the best place for a good Cubano. Believe me... hubby and I have searched the tri-state area high and low, and we have yet to discover any cafe/luncheonette serving a sandwich worth a second trip. There used to be a fabulous place in Washington Heights, but I can't remember the name right now. That was also a while back, so I'm not sure if they're still in business. Their Cubanos coupled with a batido de fruta bomba were to die for!! And I've never been a huge papaya fan. Believe it or not, there's one place that hubby and I go to when the Cubano mood kicks in. It's a pan-Latin restaurant in Park Slope, Brooklyn called Bogota Latin Bistro. The sandwich is not entirely authentic, but it's probably the closest we've come to a nice attempt at a Cubano. The pork has that marinated flavor and is juicy and tender. 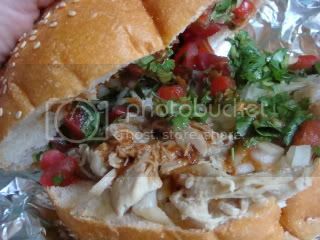 So, even if you like sandwich de carne de puerco (lechon), you'd like this one. Here's a pic of the Cubano from Bogota Latin Bistro. In actuality, the sandwich is much larger than what appears in the photo, and we've never had it served with lettuce. Nice sandwich nonetheless. I used to work on 121st and Broadway in Manhattan and I used to go to Floridita (Cuban and Dominican cuisine) on 126 and Broadway and they had very good Cuban sandwiches. Not as good as the ones I got on La Calle Ocho in Miami but pretty good. That being said I won't make a special trip to either place just to get a good Cuban sandwich. We should have a good one available in JH. I was discussing Cuban sandwiches at work with one of my Cuban Buddies this afternoon and he told me that Rincon Criollo on Junction just south of Roosevelt has really good Cuban food and sandwiches. I am going to try one soon and report back. I adore Rincon Criollo, though I have never tried their sandwiches. Their pork is excellent, I love their rice and beans, and mmm... now I'm totally in the mood to go back. It's been too long. I used to work at 137th and Broadway, and fondly remember La Flor de Broadway / El Rey del Sandwich. Unfortunately, I never made it to Floridita (which may not survive Columbia's expansion). Living here and loving it! Just got back from Legends and had the "signature special" sandwich....fantastic...grilled chicken, peppers, bacon, chipotle on a chewy Portuguese roll.. Plus it's as big as a football, so I have the other half for lunch tomorrow! sara under the 7 did a post on serious eats about cemitas. she went to some of the big dogs. does anyone have any experience on ones other than here? the only one ive been to elsewise is el sol. which was not bad. my fav so far is from mi buella puebla. I am always disappointed with the buns and pick the delicious goodies out from between them. yeah, the buns/rolls are kind of an acquired taste, a little....chalky or dry or something. i usually start deconstructing partway through as well. In the Serious Eats article, Sara Under the 7 mentions Panaderia Coatzingo. I've never been in there, but am curious to know if they bake their breads on premises. Does any bakery in JH (besides Cannelle)? I like the sandwiches at Iavarone Bros. located on the corner of 69th Street and Grand Avenue in Maspeth. They specialize in Italian heroes and fresh, hot/cold pasta and antipasta platters. We've purchased the 3 ft. Godfather heroes for parties, and they've always been a hit with our guests. Iavarone also has a nice selection of fresh meats/chicken/sausages and also offers butcher services. Yes, I have! If you stop by, try the quinoa salad... It's delicious! They'll let you try a taste before purchasing. Do we have any to nominate from Jackson Heights or elsewhere in Queens? My personal favorites include: Kati rolls from Tawa Foods (to be honest, it's been a while, and I don't know if they still make these), Lomo Saltado sandwich at Juanita's, and Ramen Burger in LIC. What are your picks? If you're confused about what might count as a sandwich, please see this helpful website.